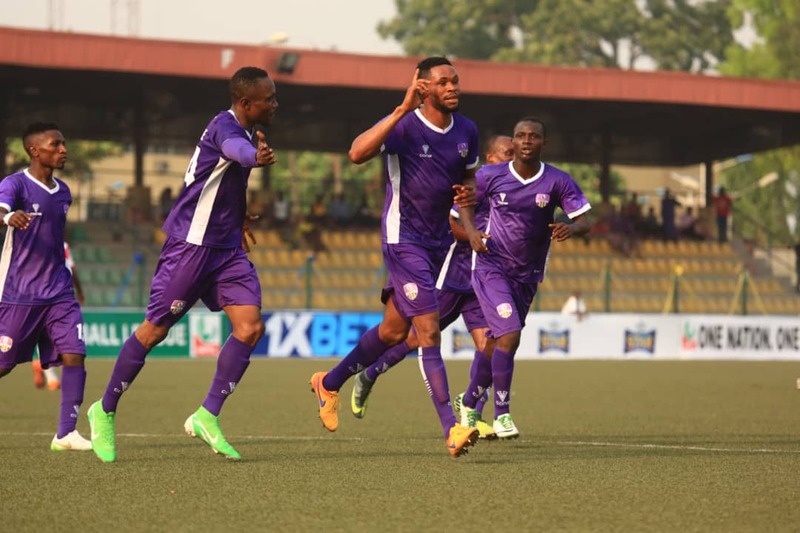 MFM FC scored in stoppage time to become the first team since Wikki Tourists in 2015 to win a league match from two goals down when they stunned visiting Niger Tornadoes 3-2 in a 2018/2019 Nigeria Professional Football League Matchday 8 encounter at the Soccer Temple, Agege, Lagos on Sunday. Not since Wikki mounted a stirring comeback from a two goal deficit against The Flying Antelopes to win 4-2 had such a feat been repeated in the topflight and the celebration from the players and fans of MFM at the end spoke to the improbability of it all. High flying MFM were seeking a third victory on the trot after dispatching Wikki Tourists and Remo Stars on consecutive Match Days – the latter a first away win since 2017. In visiting Tornadoes, they couldn’t have asked for more obliging opponents at the Agege Township Stadium where they had won all three matches played keeping clean sheets on each occasion. Tornadoes were yet to pick a point away from home and had done away with their former coach Bernard Ogbe after picking up a paltry three points from their first six league games, indeed they only secured a first victory of the season on Matchday 7 under caretaker coach Hamza Abara and everything looked set for an MFM win. But Tornadoes apparently didn’t get the memo and were two goals up inside nine minutes courtesy of strikes from Peter Abashiya and Jonathan Osondu. In truth, MFM were poor and could have gone four down inside thirty minutes and were lucky not to concede a penalty in the 23rd minute. Perhaps they were shell shocked by the rapidity of Tornadoes’ start; more likely though was an affliction of bad starts that have blighted all their home matches this season. Abisoye Olawale pulled one back for the Olukoya Boys in the 45th minute to give some belief to the home side before the break. It was a different MFM that emerged in the second half and when Michael Ohanu pulled them level in the 52nd minute, it seemed a matter of time before they pulled off the improbable and it duly happened three minutes into stoppage time when Chuks Kenedinum sprung a badly orchestrated Tornadoes offside trap to score a remarkably calm and exquisitely taken lob over Aliko Mustapha to send the home fans into rapturous celebrations. MFM maintain their place on top Group A with 15 points from seven matches. Second placed Enyimba had diminutive midfielder Chukwuka Onuwa’s first goal for the club to thank for a one-nil victory over Remo Stars at the Enyimba Stadium in Aba. The home side wasted a host of chances to take the lead and had to wait until the 83rd minute for the former MFM player to score the winner from the bench. In the group’s final game, Segun Alebiosu banished ghosts of a missed penalty on Matchday 1 against Sunshine Stars to score from the spot in Kwara United’s one-nil win over visiting Wikki Tourists at the Ilorin Township Stadium. In Group B, Heartland FC dropped points at home for the first time this season when they could only manage a one all draw against FC Ifeanyi Ubah who seem to have fully recovered from the blip against Abia Warriors on Match Day 6. The Naze Millionaires couldn’t convert their dominance into victory eventually finishing the match at the Okigwe Township Stadium with 15 shots and 12 corners but just the one goal. Joshua Akhabue put the hosts ahead in the 16th minute but Chijioke Alaekwe levelled the score for the visitors with their very first shot in the 55th minute. FC Ifeanyi Ubah weathered an unending wave of attacks to leave with a share of the spoils and a spot on top the group level on 15 points with El-Kanemi but with a superior goals difference of +4 to El-Kanemi’s +1. Kano Pillars continued their Jekyll and Hyde approach to the season when they dispatched Yobe Desert Stars 3-1 in Kano. Rabiu Ali opened the scoring for Sai Masu Gida with an expertly taken free kick in the 28th minute. Chinedu Sunday and David Ebuka further extended their lead but Phillip Auta scored a penalty in the 87th minute to reduce the deficit for Desert Stars. Innocent Gabriel scored for El-Kanemi as they dispatched Abia Warriors one-nil at the El-Kanemi Sports Complex Maiduguri to go joint top of Group B while Plateau United were one nil winners over Go Round FC in Jos. Jesse Akila scoring the game’s only goal. Three matches will be played today with Sunshine Stars playing hosts to Katsina United in Group A while Akwa United welcome Kada City to Uyo and Gombe United trade tackles at home to Nasarawa United in Group B.